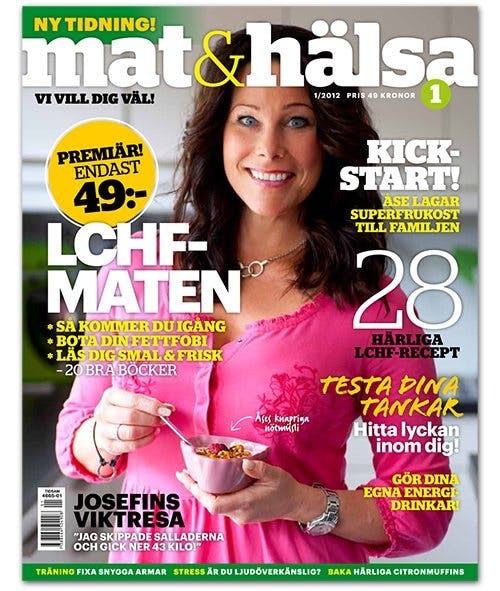 Believe it or not, there are now three magazines in Sweden about Low Carb High Fat eating. Two of them are published monthly, started this year and can be found in any newsstand. It’s not a coincidence, people want information about LCHF so these magazines are very popular. The title of the third one translates to “Food & health”. Pretty stealthy for a subject that is still controversial. One of the articles advertised on the cover is titled “Cure your fat phobia”. More and more Swedes are cured already. That's great news! Here in the US every supermarket checkout has copies of Cooking Light (guess what kind of recipes are in it), Cooking Healthy (guess what their idea of healthy is), and Cuisine Light (if it's "light" it ain't "cuisine" in my book!). Meanwhile, yesterday when I posted a picture on Facebook of my grilled salmon with a dollop of sesame mayonnaise, accompanied by green beans and cauliflower fried "rice," on of my religiously low-fat friends commented, "What kind of bird pooped on your fish?" Nothing like having a little snarkiness with your insulin resistance! That´s great news not only for the Sweedes because it will spread around the world like rings on the water! Ah good for the Sweedes to be open minded like that! I horrified my fellow nursing peers when they saw me slather butter all over my lunch today! It is funny that they use the English abbreviation "LCHF". I'll be in Sweden for about six weeks this summer. I'm looking forward to some open minds for once. That´s really great stuff! Keep 'em coming I say! @lowcarbshighfat: I just saw your blog and look forward to trying out some of your recipes! They look really good! Its really great to have found this site where i can talk to like minded people. I have read all about LCHF and am well impressed and ready to start.